If you have diabetes, it’s important to talk with your health care provider about your treatment. This includes selecting a safe and effective blood glucose target range that fits your goals, priorities, and lifestyle. Your provider and VA health care team can help tailor a treatment plan to get you to this range safely and effectively. This will also help you to avoid low blood sugar, (also called hypoglycemia), a potentially serious problem. Your team will help you to recognize the symptoms of low blood sugar, and how you can treat it quickly and effectively. The new VA-DoD Clinical Practice Guideline on Managing Diabetes Mellitus in Primary Care emphasizes the importance of partnering with your entire health care team on all aspects of your diabetes care plan. You can help your provider and health care team by planning ahead for your visit, telling them about your needs and preferences, and joining with them to make decisions about your care. Let your health care team know about your questions and concerns at the beginning of your visit so that they can be sure to cover those topics. These are all great ways to be more involved in your own diabetes care. If you aren’t used to being this involved in your own care, it can be hard to know how to best work with your provider and health care team. Here’s an example of how one Veteran worked with his VA health care team to better manage his diabetes and avoid low blood sugar. Bob is a 75-year-old U.S. Navy Veteran who has diabetes and high cholesterol (hyperlipidemia). He planned ahead and came to his check-up ready to discuss the medications he was using. He told his nurse that he was taking daily insulin glargine, twice-daily metformin, and daily pioglitazone. Based on his blood sugar readings, he was also taking insulin regular using a sliding scale (adjustable) dose. Bob had an A1c of 6.9%, but his age and medications put him at high risk for having blood sugar (glucose) that is too low. 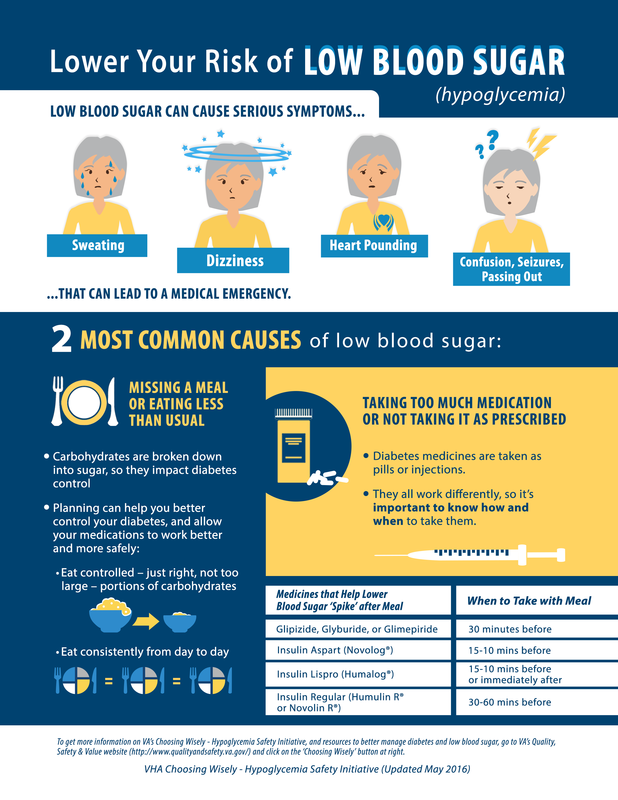 Low blood sugar, also called hypoglycemia, can be a medical emergency. Bob’s nurse asked whether he’d had hypoglycemia and explained that the symptoms can include fast heartbeat, sweating, headache, hunger, and weakness. Bob recalled having a blood sugar below 70 mg/dL two times recently. One time, after having a salad for lunch and working in the garden, his blood sugar was 44 mg/dL. This reading was dangerously low and put him at risk for serious problems like passing out or having a seizure. Additionally, Bob was using insulin regular when his blood sugar was not elevated and using too much when it was needed. This was making it harder for him to safely manage his diabetes, and increasing his risk of low blood sugar. Bob talked with his provider about his health care preferences and goals. Together, they found a way to meet his health needs. He agreed to use the sliding scale, but with a reduced dose of insulin regular. 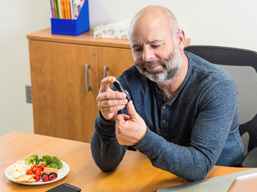 Bob’s provider referred him to attend diabetes classes, meet with a registered dietitian, and see a pharmacist for help managing his medications. After working with his healthcare team for several months, he was able to safely manage his diabetes through a better understanding of his medications and his eating habits. Now, both Bob and his VA health care team are satisfied with his care and health. Bob’s care is meeting his needs and goals, and he’s successfully controlling his A1c. Bob and his team are also happy because he hasn’t had any more low blood sugar readings. The VA-DoD Clinical Practice Guideline (CPG) on Managing Diabetes Mellitus in Primary Care (https://www.healthquality.va.gov/guidelines/CD/diabetes/) provides specific information for patients and family members as well as for the health care team. The CPG stresses the importance of working with your provider and health care team to select appropriate blood glucose ranges based on your goals, priorities, and lifestyle and design the best diabetes care plan for you.